See below a list of Mute Soundproofing® clients, followed by a selection of video testimonials, from a range of recently completed projects. Problem: Reverberation in large kitchen/diner. Solution: Suspended sound absorption panels, applied to kitchen/diner internal ceiling. Problem: Airborne sound transmission via living room party wall. Solution: Sound insulating independent wall system, applied to living room party wall. Problem: Impact sound transmission via open-plan party ceiling. Solution: Sound insulating ‘Room-Within-A-Room’ system, applied to designated ‘rest & relaxation’ area. Problem: Airborne and impact sound transmission via living room party floor. Solution: Sound insulating cavity floor system, applied to living room party floor. Problem: Airborne sound transmission via internal doors, connecting classrooms. 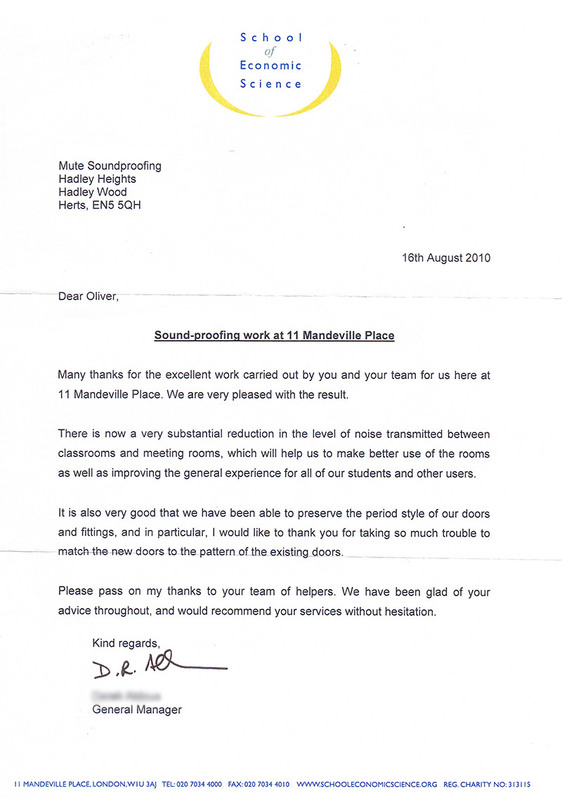 Solution: Replacement soundproof doors, applied throughout Grade II listed building. Problem: Airborne and impact sound transmission via living room and bedroom party ceiling. Solution: Sound insulating independent ceiling system, applied to living room and bedroom party ceiling. Problem: Airborne and impact sound transmission via bedroom and hallway party wall. Solution: Sound insulating independent wall system, applied to bedroom and hallway party wall, plus supplementary soundproofing works, including soundproof door to bedroom.